At StoryWeaver we're always looking at features we can add to the site that will help our community! Tags are descriptive keywords you can add to your story to help people find your content. 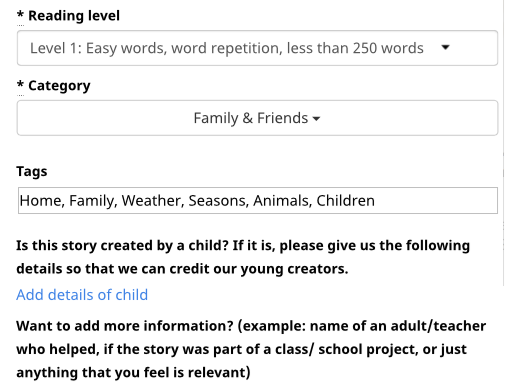 You can now add tags to the stories you create on StoryWeaver. Here's how. Step 1: Create your amazing story from here. Step 2: When you're ready to share it with the world, click on Publish. Step 3: On the story details page you will now find a box for tags. See the screenshot below. Step 4: Enter as many tags as you like, separated by commas. Step 5: Publish your story! Step 6: Follow the same steps outlined above. So, the next time you're creating on StoryWeaver, don't forget to play some tag! It will help others discover and enjoy your creation. Have a story you've created on StoryWeaver that you'd like us to know about? Share it on Twitter or Facebook and tag us!